Here is a round-up of my favourite front garden ideas. Your front garden is part of your community. It’s what people see when they walk home from work. You can talk to neighbours while you’re working in it. Your front garden also has an environmental impact. The RHS’s Greening Grey Britain campaign aims to prevent everyone from paving over their front gardens to make parking spaces. It also has good ideas for those who want a parking space but are prepared to share it with plants. So, in no particular order, here are some front gardens that cheer people up when they walk past them. They’re (almost) all easy to adapt yourself and they’re not expensive. If you are mad about plants, then your front garden is a wonderful place to display them. This garden below is one of four gardens in a row near me in Faversham. Each of the four front gardens is completely different but delightful. This front garden makes plants its priority. It’s always a pleasure to walk past. 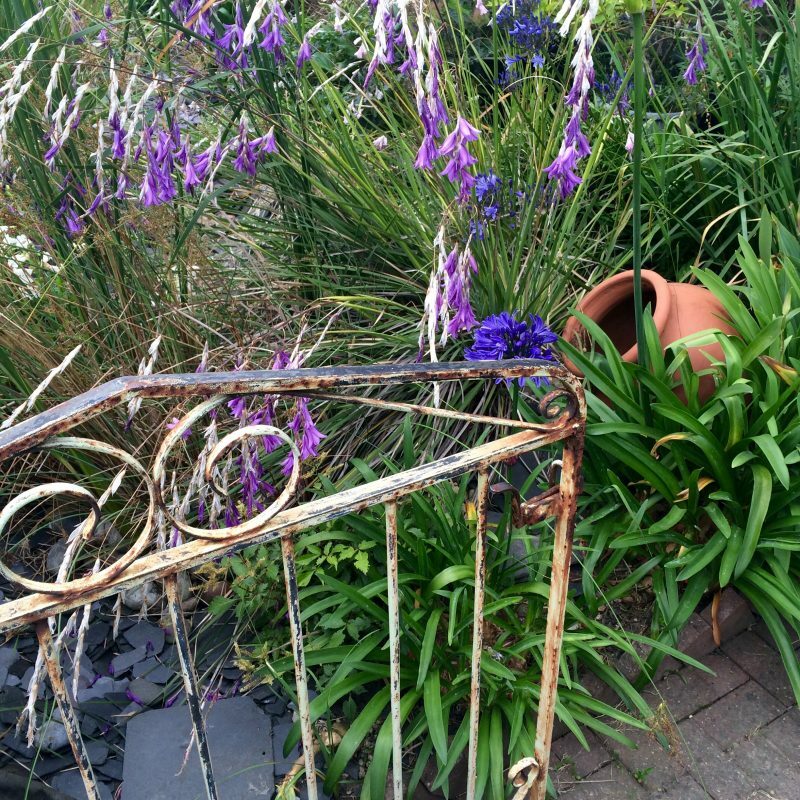 Angel’s fishing rods and agapanthus work well. Another Faversham front garden for plant-lovers. It always has something in flower. This is the next garden in the row of four. It has a classic formal design, and is planted mainly with lavender. The blue of the lavender works well with the duck egg blue front door.